Ruth Broyde Sharone was the first of four TIO correspondents who write each month for this publication. An author and film maker, she has roamed the globe and shared more than 50 stories for TIO about the remarkable interfaith activities she discovers everywhere she goes. Four years ago, in spite of a chock-a-block schedule, a new, unexpected reality showed up in her life, the emergence of a musical. Now she shares a progress report of what so many of us hope will grace Broadway and a thousand high school and college productions. What if, when you awoke, you were wearing a stranger’s shoes? What If, when you awoke, you shared your enemy’s extremist views? What if, when you awoke, you’d think in color – not black or white? What if, when you awoke, you could imagine not being right! "Your children are not your children … They come through you but not from you … And though they are with you yet they belong not to you." As a writer and filmmaker, I was most at home expressing myself through the written word and cinematographic images. Why would I suddenly be expressing myself in music? Did this song come through me but not belong to me? When I shared the song with my sister, she said in astonishment, “I didn’t know you wrote songs.” I had studied piano as a child and experimented with writing songs from time to time, but this new development seemed to come out of left field. I have always believed the arts to be the most powerful vehicle for conveying the message of our shared humanity; a message I jubilantly advocate as an interfaith activist. Now, for some mysterious reason, the message was being revealed to me in song. Where was it all coming from? Where does the interfaith muse reside, I wondered? It is waiting expectantly to be plucked out from the same inexhaustible well of creativity that is the Mother source of all art forms? The chorus for the song tumbled out next. The beauty of one expanding humanity? By the time I finished my walk, some 20 minutes later, I had a complete song in my head. I would polish it slightly in the days to come, but most of the original lyrics remained intact. What if Mormons could recite a Buddhist mantra and feel at ease? What if Muslims could admire the Hindu's tantric expertise? What if Jews could tell the difference between Peter, Paul, and Mark? And the faithful would confess that they too fear the dark? What if through song we could help people explore ideas and philosophies that seemed strange and foreign to them? The juxtaposition of unlikely religious and political combinations that popped up made me laugh out loud. What if Hindus could be well-versed in secular humanity? What if Jains learned the basics of Wiccan philosophy? And atheists could agree that religion is not a bore? During my interfaith journey I have learned how important it is to be politically correct and respectful when discussing religion. But, I thought to myself, isn't there some politically correct way to poke fun at ourselves, to laugh at our foibles and idiosyncrasies, even as we take our faith seriously? What if Witnesses of Jehovah could quote Upanishads? What if Buddhists would grant the existence of One or many gods? What if Sikhs agreed to master a few Gregorian chants? And leftists would try on a pair of right-wing pants? The final verse of “What If” burst forth, laying out my dream of the future. What if, when we awoke, we could practice empathy? What if, when we awoke, we could embrace diversity? What if we could see ourselves as the lilies of the field? What if, when we awoke, we were ready to be healed? In the two years that followed, I would write almost 30 songs, including both serious and amusing lyrics. I was eager to use the songs to explore the clashes in belief that profoundly affect people’s daily lives. Some of the songs contained material that would undoubtedly create new wounds or open up old ones, but I decided I would have to take that chance. When I have children of my own? If there's no freedom to be me? The song “I’m a Bu-Jew” became a musing about friends of mine who successfully practiced two distinct religions simultaneously with no noticeable deleterious side-effects. Hadn’t we been told that was impossible? I hadn’t noticed that, although I did recognize my desire to reach out beyond the interfaith movement into mainstream America. Those of us in the interfaith movement have been preaching to the “choir” for many years. While we observe the choir getting larger, we feel we can and should do more. But how? From there everything started falling into place. I was introduced to KC Daugirdas, a very talented young arranger, who took my melodies and lyrics and helped me transform them into an 11 song album. 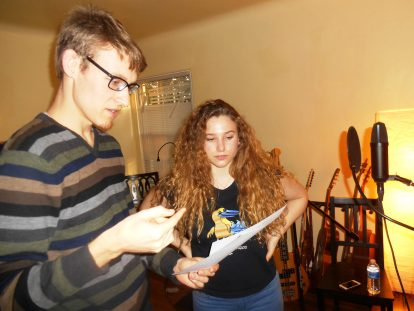 We recorded the songs in his home studio with singers from my own synagogue, Ohr Hatorah, including the Rabbi’s 17-year-old daughter, Avigayil Finley. Two other young singers from the Los Angeles musical theater community, Liam Roberts and Alyssa Rupert, along with two other friends, also signed on — all in all, nine people. I have had an opportunity to receive feedback from many different audiences, small and large, when I present the songs. They’ve all seemed not only enthusiastic, but hungry for the messages in the songs. It's time. 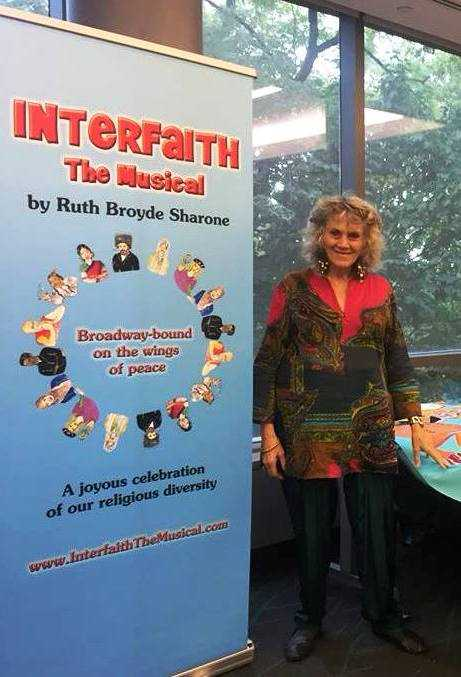 People are ready to see a play that reflects who we are; a play that openly addresses the challenges of an interfaith society. Last summer three of the songs were performed publicly by the Adat Shalom Choir in Balboa Park, San Diego, as part of the 2018 North American Interfaith Network (NAIN) Connect. Come o come, meet me there.